Did you watch the video? No? I’ll wait. Okay. Now watch it again. Another time, and then 11 more times after that. Now that we’ve taken care of that, let’s talk about the match. The Sounders collected three points in a one to nil win over the Houston Dynamo, in a match that Sounders go down to 10 men for 34 minutes. 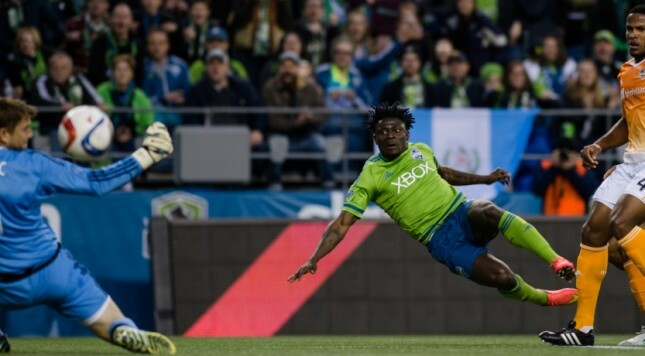 Aside from an absolutely stunning goal by Obafemi Martins, and a Mortal Kombat impersonation by Gonzalo Pineda, there wasn’t a whole lot to be excited about. Below, I’ll be discussing the things that piqued my interest after the match. The season is still short, but has been filled with Keeper gaffs left and right. Especially this past week. Stefan Frei has quietly become one of the better goalkeepers in the league. He’s had 3 clean sheets in 4 games. He hasn’t allowed a goal in over 200 minutes. Sure, a lot of the credit can go to the defense in front of him, but he’s starting to show glimpses of his old form. Sounders fans have long, fragile memories, and Frei shouldered a lot of the blame for last season (deserved and not deserved), but I think those fears can finally be put to rest. I’m excited to see Frei continue to blossom. Boy, was Ozzie Alonso a site for sore eyes on Saturday night. I don’t think it’s a stretch to say that the central midfield without Alonso hasn’t been the most stable environment over the first few games for the Sounders. Michael Azira filled in admirably, but he is no where near the talent Alonso. Alonso doesn’t get a lot of credit for the work that he does for Seattle, but there was a noticeable difference Saturday night. Overall, there wasn’t much to take away from this match. It’s nice to see the Sounders be able to ground out these types of games, that’s for sure. It’ll be interesting to see what type of game they get in LA this coming Sunday.